[Level T2] OK, so you have created your Web API project and deployed into production and now boss says dude, we have performance problems. Or maybe head of testing wants to benchmark the application and monitor it over the course of next releases so we catch problems early. Or you are just a responsible geek interested in the performance of your code. 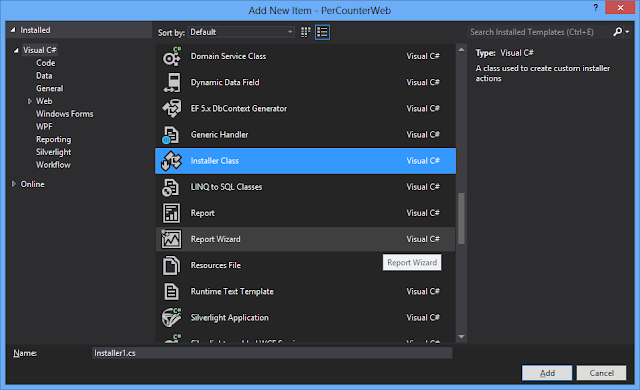 Use "Add New Item" to add an Installer class into your Web API project. Write just a single line of code for Install and Uninstall. Use InstallUtil.exe in an administrative command window to install (or uninstall) your counters. Done! Seeing performance counters of your own project is kinda cool! The string passed in here is the application name. This will be used as the instance name in the performance counter. You can see that in the screenshot above. Here we have decorated GetAll and Get to publish two types of counters (currently these counters are available but more will be added - see below). The format of the counter will be [controller].[action]. [counterType] (see screenshot above). As such, please note that we had to change the first Get to GetAll to so that the counter names do not get mixed up. If you cannot do that (while ASP.NET Web API allows you do change the name as long as the action starts with the verb), alternatively use the Name property of the filter to define your own custom name (which we did not specify here to allow default naming take place). Description property will appear in the perfmon.exe window and is known as CounterHelp. Counters is an array of string, each string being a defined against PerfIt! runtime (see roadmap for more info) as a counter type. Another option is the ability to define Category for the counter which we also did not specify so by default, it will be the assembly name. You can see the category in the screenshot above as PerfCounterWeb (see the typo!). This should do the trick. Use -u switch to uninstall the counters. That is all that is needed. Just hit your app and start benchmarking your app in the perfmon.exe. I have kept the default behaviour to publish counters - so to eliminate one configuration step to get up and running. This may change in the future - but unlikely. I needed to add performance counters to my Web API application. With wife away and a few Easter bank holiday days, I managed to start and finish version 0.1 of PerfIt! library. Future work includes adding more counter types and looking at improving the pipeline. PerfIt! has been built on the top of its own extensibility framework so very easy to add your own counters, all you need is to implement CounterHandlerBase and then register the handler in PerfItRuntime.HandlerFactories. Any problems, issues, comments or feedbacks, please use the GitHub issues to get it touch. Enjoy! Can we add custom counters? I want to know time taken by each request instead of average. Is this possible?